Mission accomplished. 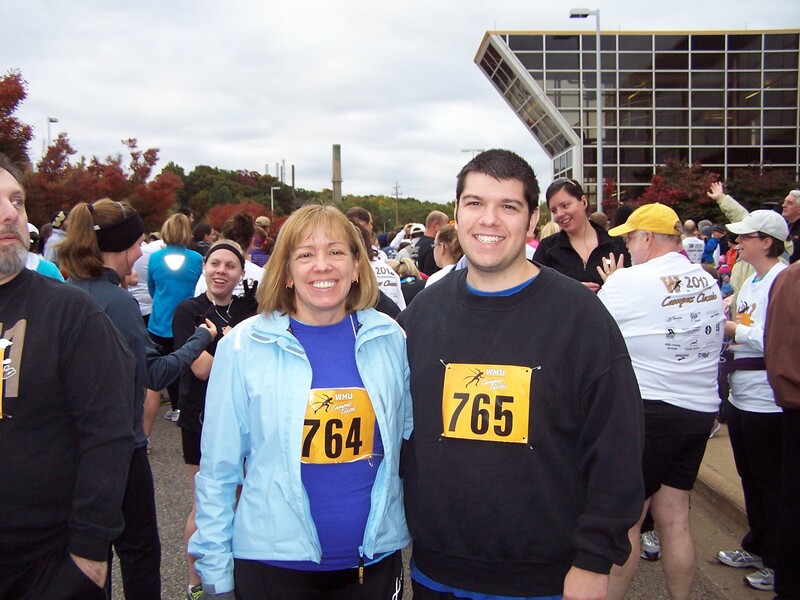 Here’s my son Mike and I prior to my injury-free 5 K race. Mike did great – we started together and seconds later I never saw him again. I kept my usual slow pace and managed to complete and remain injury free. But I’m dialing it down for now – no more 5K’s for a while. I’ll stick to my two miles two or three times a week, and behave. Maybe we are born to run, but at least for me, only in short, slow distances. Kudos to blogger buddy Martin at Thoughts from Finchley who recently dusted off his old cycling jersey and got out on his brand new bike. I expect to see him passing me by any time now. Meanwhile, cold weather is moving in here, making it almost impossible for a sissy like me to get outside and run or bike. For the next few months I’ll probably be mostly stuck in the gym, getting all tangled up on the treadmill, or slogging through yet another spin class. What do you do to stay active now that the weather is turning colder? This entry was posted in Exercise and Fitness, Health and Wellness and tagged 5K, born to run, Christopher McDougall, running by Huffygirl. Bookmark the permalink. Congrats on the 5K 🙂 Good effort! Thanks Martin. I think you British folks are more hearty when it comes to doing things outside in the rain than I am. I’ll go out for a run in a light mist on a warm day, but other than that, I’m inside. Today I saw two women running in pouring rain and decided they were better people than me. We do have rowing machines at my gym, and even a rowing class. So far I’ve not excelled at it, but who knows what a long winter held hostage at the gym might bring. Thanks Martin, you too. Keep me posted on your biking. Bravo! Congrats! You’re inspiring me to get back to running. We rode half of the Black Bear Century today (no bears in sight). Very cold but gorgeous scenery, views and fall colors. Probably the last ride of the season unless we get some warmer days. Bravo to you too – 50 miles on a cold day is pretty impressive, even without the bears. I’m hoping to get in at least one more ride here, to bring me up to 1,200 for the season, but so far the weather has not cooperated at all. Glad you got your ride in. CONGRATULATIONS! As for winter exercise, I depend on the treadmill – actually, that’s why we bought it! There are just too many days here when it’s either heatstroke hot and humid, or icy, or raining hard. And back when I was working, there were the six or eight weeks of the year when I left for work before dawn and came home well after sunset. The basement isn’t scenic, but it’s controllable. Thanks Sharon. I too often have the work days where I leave before sunrise and get home after dark. I have my bike on a trainer in the basement, but often find that spin class at the gym is more bearable. A TV in the basement sometimes helps though. Thanks Angelia. I know what you mean about adding that extra mile – I guess we should stick to what works for us, but human nature and our competitive instincts tell us to try for more. Darn that army catch phrase – “be all that you can be…” At your recommendation, I may try Zumba. There are classes at my gym. The trick is being able to get there at the time they have the class. Thanks Gilly. I guess you need the constitution of my sister Linda (see comment) if you want to get your exercise during the winter. Or put a treadmill in the basement like a lot of people do, if you can stand the boredom of exercising in the basement. I walk outside. Cold doesn’t stop me–only rain. Impressive. I last about 5 minutes in the cold, sometimes not even that long. You probably were meant to live in England. Yea,I recently went back to work after the knee replacement and actually got out my walking shoes for real and went two miles.I hope to have an injury free ease in myself.Congrats! Thanks LN. Wonderful news on your knee. Two miles already is amazing. Keep up the good work. Fantastic! How great to do it with your son! Thanks Theresa, it was. Although I had to call up a lot of “mom guilt” to convince him to do it with me. Hope I can convince him again some time. You are so impressive and inspiring. I walk home from work but that’s only 1.5 miles. I need to be more like you!!! Thanks Andrea. I think walking home 1.5 miles is nothing to sneeze at, especially in the heat where you are. Maybe I should be more like you and do something sensible like walking! I’ve been working on a workable plan (i.e., stalling) to bike partway to my job every day – thinking that I might drive to our River Trail, and bike that the rest of the way. We’ll see how it goes! Well, isn’t stalling how great people finally get things done?